Toyota has recently sold Australia's 200,000th LandCruiser Prado. Toyota Australia's executive director sales and marketing Matthew Callachor said the sales milestone signifies the loyal following amassed by Prado since it arrived here in 1996. 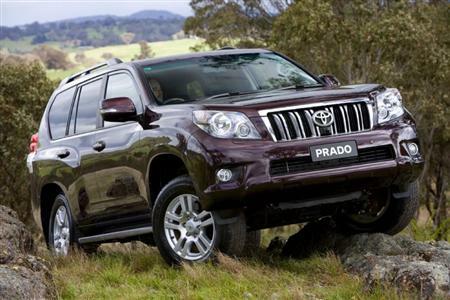 "LandCruiser Prado is the only vehicle in its segment to reach the 'double ton' of 200,000 sales," Mr Callachor said. "It was Australia's top-selling large SUV in 2012 with sales jumping more than 57 per cent to a record 17,045 deliveries - or a grand total for Prado in this country of just over 197,000 units." "This month, we have passed the 200,000 mark." Mr Callachor said Prado has grown in popularity over the years. It took Toyota just over 10 years to reach 100,000 Prado sales and only seven more years to double the tally. In the past decade, customers bought an average of more than 14,600 a year - making Prado a significant contributor during a period in which Toyota has been the overall market leader. Toyota is also the best-selling SUV brand with 2012 sales growing 25.9 per cent to a record 58,745 vehicles - more than 21,000 units ahead of any other marque. Along with Prado, Toyota's other SUV models - Kluger, FJ Cruiser, RAV4 and LandCruiser wagon - posted healthy gains. Mr Callachor said milestones were not a focus, but a measure of how well Toyota and its dealers provided customers with quality vehicles and service. "We are grateful for the loyalty shown by such a large number of Australians from all walks of life who continue to put their faith in Toyota, our dealer network and LandCruiser Prado," he said. LandCruiser Prado has 14 variants. The five-door family wagon starts with a GX grade offering five or seven seats and powered by a 3.0-litre common-rail direct-injection turbo-diesel engine. Higher-specified GXL, premium VX and top-of-the-range Kakadu variants are all seven-seaters with the choice of the turbo-diesel engine or a 4.0-litre petrol engine with intelligent variable valve timing on both the inlet and exhaust ports. GX and GXL customers can specify a six-speed manual gearbox or a five-speed sequential-shift automatic transmission. VX and Kakadu are automatics. The three-door sports-wagon variants are offered in SX and ZR grades with the turbo-diesel engine, automatic transmission and five seats. Pricing for five-door variants starts at $55,990* for the five-seat GX turbo-diesel manual. The three-door variants are priced from $56,090*. LandCruiser Prado is covered by Toyota Service Advantage capped-price servicing at $210 per service#. # Current maximum payable for standard scheduled log book servicing (normal operating conditions) until first of 3 years or 60,000km (whichever occurs first) (up to the first 6 services). Excludes government and rental vehicle fleets. Conditions apply.